-And look for a job that would let me live abroad but still make money. Simple right??? Not so much. With a budding relationship you just never knew how things might change. But he was continents away in Nepal, shortly to be in Brazil when he embarked for his job on the cruise ship, could I really depend on this thing getting serious?? Well apparently I could. Skyping almost every night for an hour or more and talking about a future life and how much he loved me after 14hrs of work, well that would make any girl’s heart swoon. I was no exception! Barely 2 months after returning home (4 months into the relationship) we were hatching a plan for me to join him for a cruise in Italy (his destination after Brazil) and see where we wanted to go. He planned to pay and spent hours trying to organize a cruise using his discount, it turned out to be more difficult and in the end I had to book but he paid me back the minute I got there. Since I was flying all the way to Italy, I figured why not take an extra week before and explore Rome. I would also get the chance to see Nicola, the vet I worked with in the Amazon, and Kate, my couch surf host in Australia. During my research I realized that I would embark in Naples, which was a hop skip and a jump from Pompeii, one of my all time dream destinations. Yes, ok, it sounds rather macabre wanting to visit the ruins of a city destroyed by a volcano hundreds of years ago… but what can I say, I love history! I was worried about the cost of an air ticket, obviously a year of travel had depleted my monetary resources and with only 3 months of work down it hadn’t increased much. But mumsy came through for me and we were able to use points to get the ticket down to $700 return to Rome. I think that last month after finally getting all my tickets sorted took longer than a life time. We were both so excited and talked every night. He introduced me to all his coworkers as his “almost wife” and I felt content in his love for me. 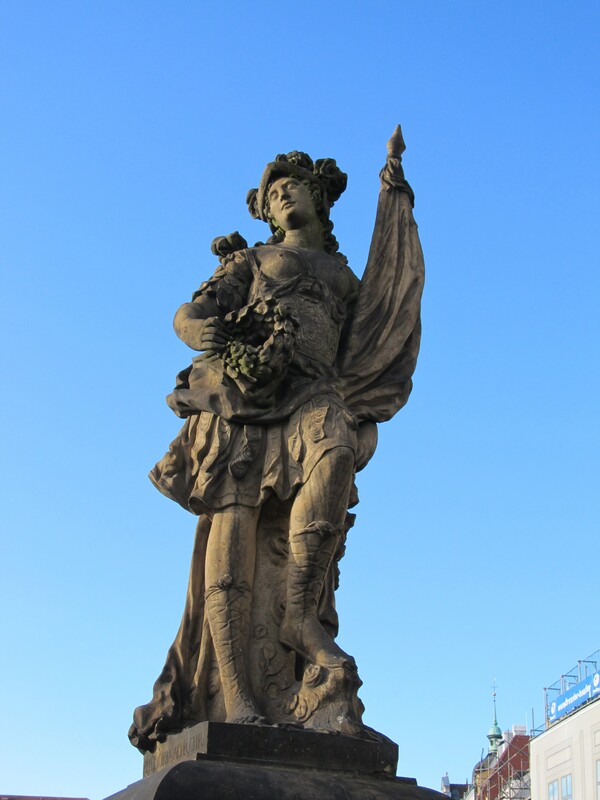 Not only was I getting a free cruise, seeing friends, and exploring Rome and Naples, there were hints of big questions…. could this trip lead to a future I hoped for??? Nadine only got home around 6am, she was exhausted. The job in Cologne/Koln took a lot longer than they had planned, she works in construction, but it had been decided that it wasn’t worth leaving it half done. I got up at 7am and, very quietly, started getting everything ready. We had to leave the house by 8am at the latest as we had to drive to Cologne/Koln for me to catch the train to Frankfurt. It would take at least an hour to get there but we gave ourselves almost a full hour extra just in case. Yvonne was driving and 10min before we were ready to leave we bundled Nadine into the car. She was so tired and just slept the whole way but was determined to come with. Why is it that when you have a long trip ahead of you and you make sure to have extra time, Good ‘Ol Murphy steps in and cause major traffic issues. We couldn’t believe the amount of traffic, add to that getting lost when “Murphy” tampered with the GPS. In the middle of all this stress about trying to get to the train station I suddenly got a call from Buddha, it was really short but he wanted to tell me that he had got his dates for the ship and he would be embarking on January 14th. It felt so good to hear from him and that he wanted me to know what was going on. Of course now I realise it was just him making sure I stayed on the hook. We got to the train station in time to see the train pull away… at least we think it was the train. The signage was a little confusing and we weren’t sure where we were. It didn’t help that I DESPERATELY needed to pee, am sure Murph’ had something to do with that as well. Yvonne left Nadine and I standing in the middle of the walk way and ran off to find out our options. I went in search of a bathroom quick but the only one involved paying and I didn’t have time to think about that. Luckily there was a train leaving in about 5mins that I was able to get on and so we ran back up the stairs to the platform and spent about 3 of the 5mins trying to figure out which train I was supposed to go on. The biggest bummer was that this train was meant to take an hour longer which meant I would have barely an hour to get checked in for my flight. Finally we found an attendant who confirmed this was the right train and I said farewell and got on. I was really sad to leave Nadine and my new friend, Yvonne. Their family had been so good to me and so welcoming, I would miss them terribly. I found a seat and settled my bags and then rushed to the loo. Oh such relief… to be on a train and heading to the airport. As I sat down and breathed a sigh of relaxation, the attendant was kind enough to inform me that I was in 1st class but only had a 2nd class ticket… oops, I wondered why this train seemed really comfortable. I made my way to the next car and managed to find a seat on the aisle next to a very nice German lady. Confirming that we were indeed heading to the Frankfurt train station/airport I promptly nodded off feeling completely exhausted from the morning events. When you are nodding off travel always seems faster and it felt like just a few minutes before my wonderful seat mate woke me up to tell me we were here. I dashed out tripping over my bags in the process and feeling completely rumpled and half asleep. I hate it when that panic of missing your flight kicks in and no matter what you do you can’t shake it off. Going up the escalator from the tracks I found myself in the main station, however all the information boards spoke of trains and there were no signs for the airport. With panic rising that perhaps I HAD got on the wrong train I headed to what appeared to be a walkway to airlines. I was flying with Iceland Air and anyone I asked just looked at me blankly. Panic was building up to outright fear that I would miss my flight as there was maybe 45min left. I ran down the walk way and finally found a board that showed Iceland Air and what terminal I needed. Now for anyone who has ever been to Frankfurt Airport, you know how huge it is. Its almost like a reasonably sized town with its own public transportation in place. I hopped on the bus going to my terminal and was soon chatting away to the others who had commented on my flag patches covering my backpack. It was good to take my mind off the drama of catching my flight. I leapt off the bus and ran into the terminal finding the check in desks for Iceland Air. There was no one around which obviously meant check in was over.. right? Huffing and puffing I handed over my passport and asked “am I still in time, can I still get on the flight? ?” The check in clerk smiled and said “of course its only 11am, the flight doesn’t leave till 1.15pm”. Oh, wait the train was meant to take 3hrs and it only took 2??? Oh thank Murphy for giving me a break. Guard 1: indicates I have to exit and go through again. Guard 1 and 2 scowl at each other. All rather amusing. I found the gate and then decided to try and call the boyfriend and actually got through. It was great talking to him and he told me he wanted me to join him on the ship for a trip and he would pay, that he missed me and was thinking of me. (Super sweet, gave me warm fuzzies blah blah blah…of course he was also asking 2 other girls at the same time to visit him on the ship and he would pay! Oh well focus on the warm fuzzies of the moment). Since I had more time than I had thought I decided to grab a little something to eat and drink. You think airport food is expensive in the states, in Europe it’s downright exorbitant. I opted for a muffin and just a glass of hot water as I had some tea I could use. When I went to pay they had charged me 1.50euros for the HOT WATER!! Good heavens how ridiculous! We all know Frankfurt Airport is enormous, but when you see the employees getting from A to B on bicycles it gives enormous a whole new meaning. Then I went and relaxed and checked the internet, at least wifi was free in the airport, for the first hour. After my hour was up I spent time calling friends and saying farewell… farewells are the hardest part. 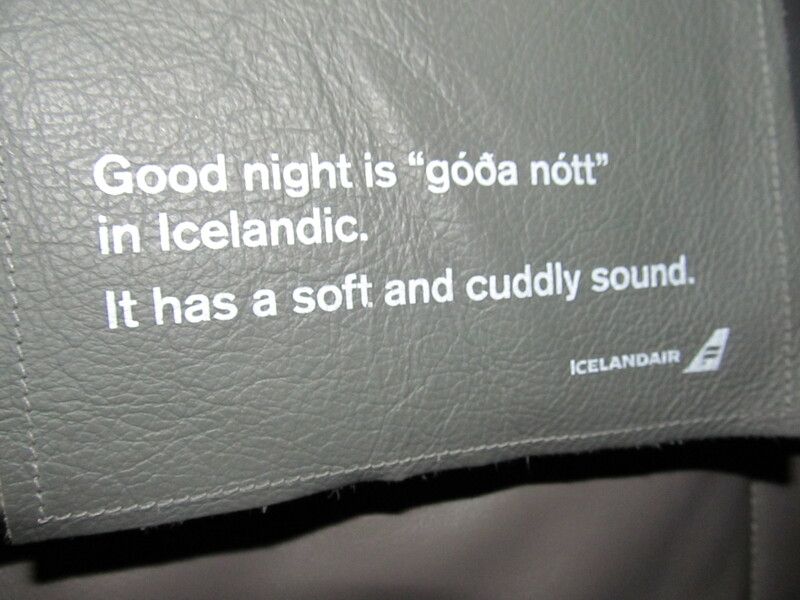 The first flight was Frankfurt to Reykjavik, Iceland. It turned out the entertainment system didn’t work and the seat arm didn’t go up. Luckily it was a short flight and they did provide us a croissant with ham and cheese. 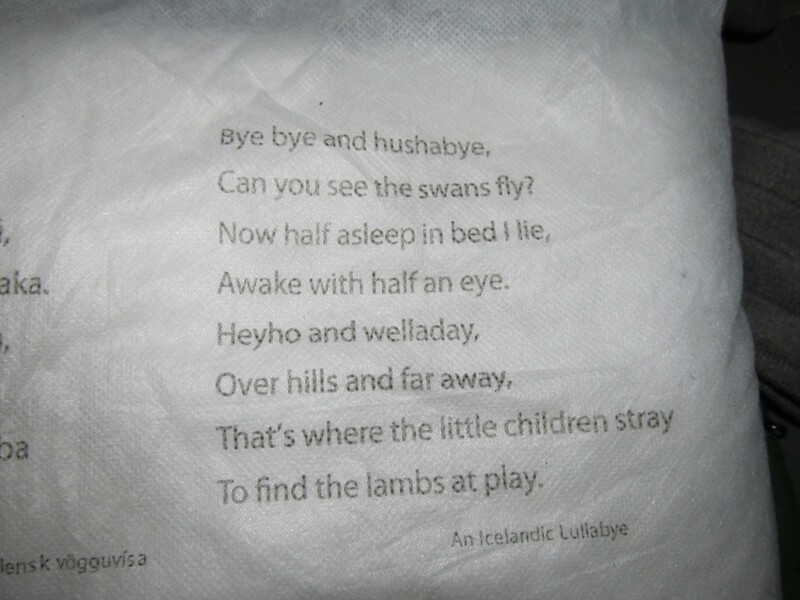 The cute part of Iceland air were the headrest covers and such that quoted little poems and sayings in Icelandic and with only a few days till Christmas all kids got gifts and chocolates. Looking out of the windows waiting for my, now 1hr delayed, flight, Iceland lived up to its name. Snow as far as the eye could see. Having a delay is always dangerous as you end up circling the stores and I soon discovered I had an armful of candy. The flight was pretty full but luckily the middle seat was free and there were good movies on the, working, entertainment system. I was starving and looking forward to some grub… until I received the menu and realised you had to pay for food. I have never been on an international flight where I had to pay for food, and the cheapest was $15 for a chicken breast that was very much airline food. Air Asia is the only airline that I have flown on where they charge for food. But that is a super budget airline and they tell you as part of your booking process and allow you to pre order. What ya going to do though, food is food and I was starving. Finally we arrived in good old Seattle. 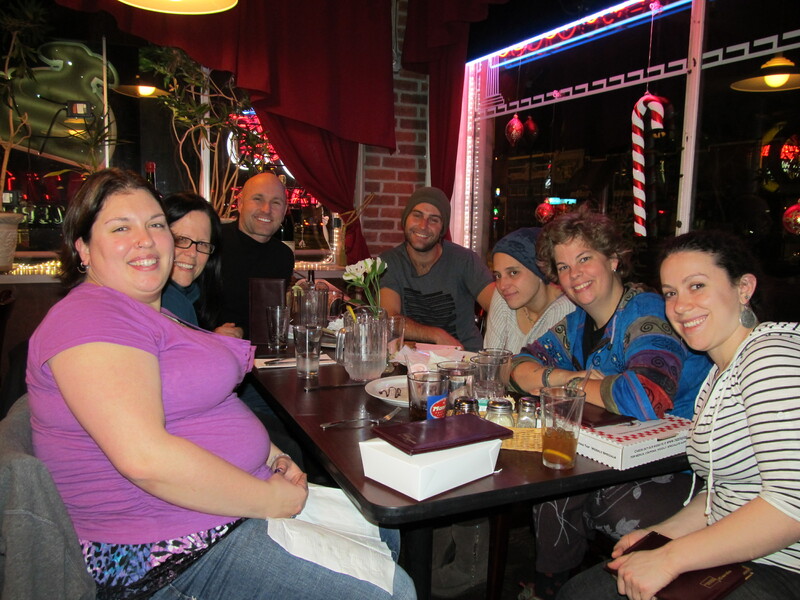 My friend, Colleen, was meeting me and going to catch up with some friends at a local Pizza place. I got a little worried when she wasn’t at the baggage claim, and managed to borrow someones iPhone (they had to show me how to use it) to try and call her. After about an hour she finally arrived, turns out she had been held up at the border to Canada by a rather stupid remark to immigration by someone she was traveling with. I never understand why people don’t just shut it and smile sweetly when passing through a border. But soon we were at the restaurant and a couple of my friends managed to show up. The food at Raizzi’s Pizza was delicious and I inhaled as much as I could. Then it was home to sleep, glorious sleep. Well the journey was almost at an end. A journey of epic proportions, lessons and life long memories. That was the plan, no more calling that is it. But… mornings were the best time to reach him, maybe just one more time… Bingo! He answered, was so good to hear him. Apparently he was out at his mother’s place and was hiking up near the cell tower so had better reception. (Good Lord and I fell for that one too). But at least it put my paranoia at ease for the moment and I could enjoy the next few days. Yvonne was excited to take me to a friends farm who raised horses. She was Dutch and had married a German Farmer. The horses were stunning and it felt so good to be around such majestic, calming animals. We helped her get some of them out of the field and chatted about farm life. The afternoon involved blog work and meeting Nadine in town. She took me to an amazing bead store, it was like heaven in little boxes with shiny things everywhere. I make jewellery using a special string and a variety of beads. Almost too exciting for one person to stand. 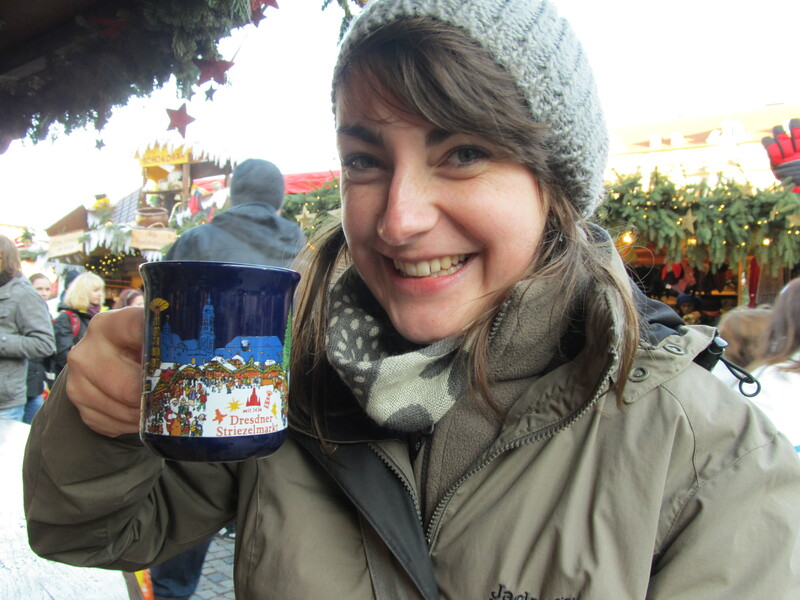 Nadine was excited to take me to her favorite Christmas Market, not the local one but one that was over an hour away. It was great fun and we spent a few hours walking around, looking at things, eating mini donuts like things filled with custard, and sugared nuts and drinking gluwein. Again it took me a long time to find the right mug and we must have walked to every single stand to check out the mugs. Finally I settled on one that was the best option. 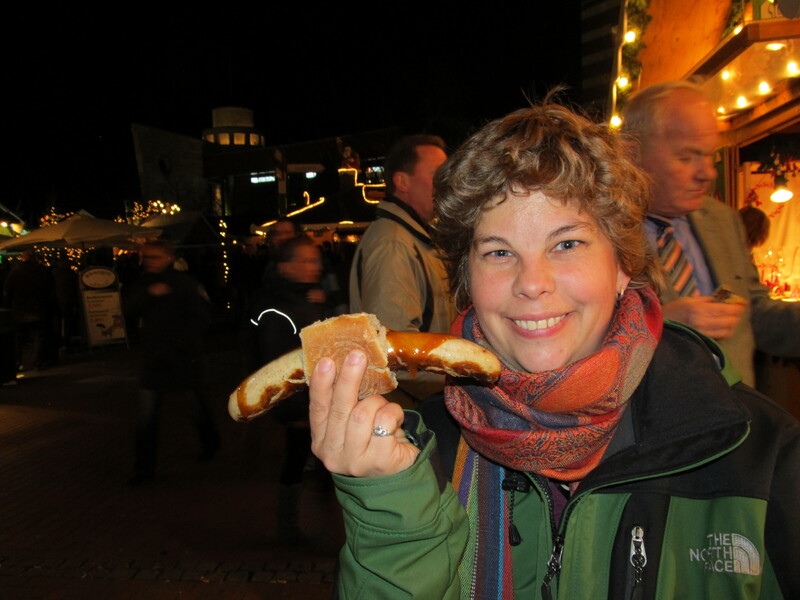 And of course the last, but most important aspect of any Christmas Market, the bratwurst. It was delicious as usual but there had been a running trend of the bread roll getting smaller and smaller as I toured through Germany, and well, this bratwurst got first place. A great night out with a great friend. Today was another farewell day, I would be moving on towards the town of Cologne and another friend that I met in Coral Bay, Australia. Cathleen told me to sleep in and went out to buy us some fresh bread and pastries for breakfast. No better way to start the morning than German Pastries and coffee with a good friend. I called Nadine to let her know and get directions, it turned out she lived almost an hour from Cologne, but had used that town as it was the only one that was well known. She lived in a town near the Dutch border called Nettetal. Being a little irritated with life in general I got a wee bit frustrated. Cathleen, in her usual wisdom, told me it would be fine and all work out. The rideshare arrived and I was suitably impressed by the very swanky car, not bad for students. Even had a seat warmer. I was given the front seat and after a tearful goodbye it was time to say farewell to a very good friend. Can’t wait to catch up again soon. Soon we were on the road and chatting about what they were studying and my travels. I tried to call Buddha on and off but kept getting the network down message. (Maybe that was the one day the network really was down and the one time he wasn’t lying to me…maybe). Anyway we organised with Nadine to meet us at an offramp just outside of Cologne, and after missing the ramp the first time we finally found it. It was great to see Nadine again. We had met the first week or so in Coral Bay, she was part of my German Contingent, a running joke as our group was about 6 parts Germany, 1 part Bavarian and me and it seemed that with every one that left another German joined. We caught up on the hour drive to her sister’s house where she lived, I felt really bad that she had come all this way to pick me up. Sometimes life surprises you with the kind of friends that are happy to go out of their way to be there for you. I had just left one such friend and was realising I had another one sitting next to me. No matter what curve balls life might throw at me, its good to know that occasionally it tosses me someone who has my back. I was welcomed as part of the family by her sister Yvonne and her husband and 2 kids and nephew. They also had a couple of goats, sheep, a shetland pony with an attitude and 2 large dogs. It felt so welcoming and everyone was excited to meet me. The teenage boy had given up his room and Nadine and I shared it. Well dinner was cooking I went to take my stuff upstairs and found it had already been taken for me, too cool. I sorted out my stuff and checked some email, I was still feeling very unsettled and stressed and wished I could talk to Buddha as it had been a few days, all I could do was email him and hoped he would reply. (Of course now I see that was wishful thinking as it turned out the girl he was living with had told him to stop stringing me along and he was beginning to listen to her). Heading downstairs I felt comforted by the fabulous family dinner and all the chaos that came with it. More adventures await in the morning. I think my subconscious was trying to tell me something this whole time. I woke up feeling really emotional and stressed. A big part of it is the end of the trip, the return to the dreaded Real Life, and trying to understand what where who… the straw that broke the camel’s back was this little thing called a boyfriend. Sometimes I wish you could just wake up and have everything seem sorted and your life planned out… but then again where’s the adventure in that? So you just keep plodding along. I tried to focus on my blog while Cathleen was at band practice. Since I was leaving soon I worked on repacking and discovered I couldn’t find my Nepali Christmas Ornament and in my fragile state…it felt like an ominous sign. I had tried to call the elusive Buddha but it just rang, apparently a sign that the signal was not going through. A mutual friend was online and he said he had just called and spoken with Buddha, so I quickly gave it another try, but it was no good. Logically I knew I was being ridiculous but emotions tend to reach a boiling point in me. I made it through to the evening when I had to walk to the church where Cathleen and her band were playing. I put on my MP3 and listened to some music that made me feel stronger and less likely to fall apart at the drop of the hat. I was feeling pretty confident and together and was thoroughly enjoying the concert. And then the band did something that was so unfair, so ruthless, so dangerous to someone in the fragile state I was trying to avoid… they played HALLELUJAH! This song makes me emotional on the best of days and right now I couldn’t stop the tears. Luckily I wasn’t sobbing like a baby but I was close. Cathleen could see me from her place and afterwards came up and asked “Was it that good or that bad, that you cried??”. She still had to finish up in the back and clean, we decided I would just head home. I must have looked like a crazy person as I was talking to myself all the way home. I made it home and luckily my good friend/shrink, Roger, was online, he calmed me down and ordered to find a cure, preferably in the form of alcohol. I walked out of the room and Cathleen’s roommates took one look at me handed me a glass of wine and said “boys?”. Funny how girls always seem to know. The roommates got me talking about my travels and that always works to take my mind off things. We looked at pics and talked about adventures until Cathleen got home. She convinced me to go out to meet her band friends and have some good German food. Food and friends are always a cure for when you are feeling down. I am fairly certain one guy was even hitting on me, later Cathleen said he actually hits on anything that even looks vaguely female… oh well still going to count it. 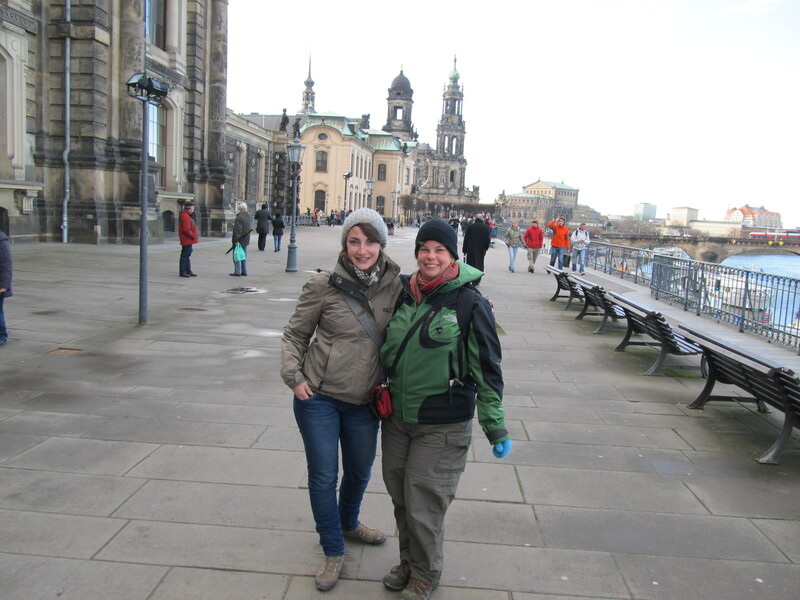 Cathleen and I had a big day planned, we were heading to the old city of Dresden, reputed to be one of the prettiest in the area. Through the rideshare site, Cathleen had managed to join a girl with a “group” ticket on the train. Normally it would cost 20+ euros for a ticket one way to Dresden, crazy expensive. But the group ticket allows 5 people to go for the cost of 25euros (5 euros each). The other 2 were twins both studying law. 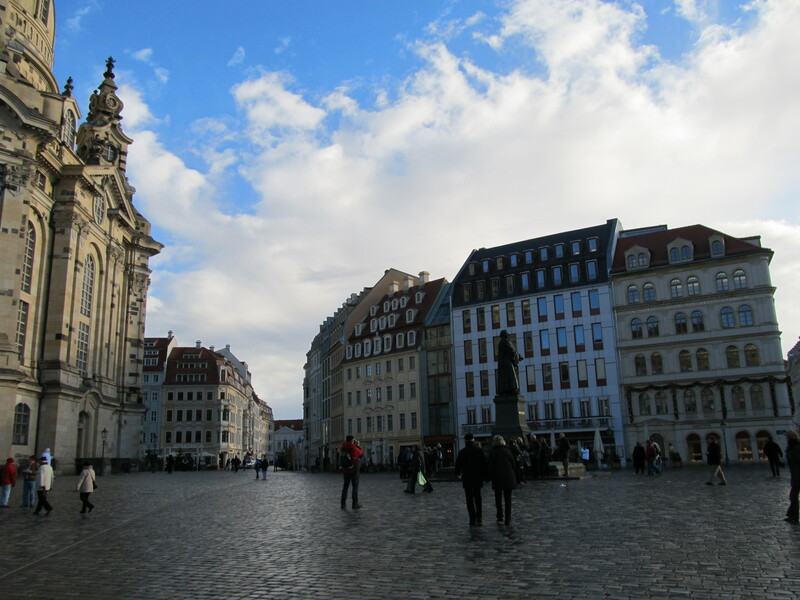 Dresden lived up to everything I was told about it, absolutely stunning with tons of old buildings and wonderful Christmas markets and when the sun came out, stunning weather too. We stopped in at the Tourist Information center, picked up a map and were off exploring. A truly great day, but even though the sun was out it was still pretty cold. For lunch we stopped at one of the markets and got our usual bratwurst. 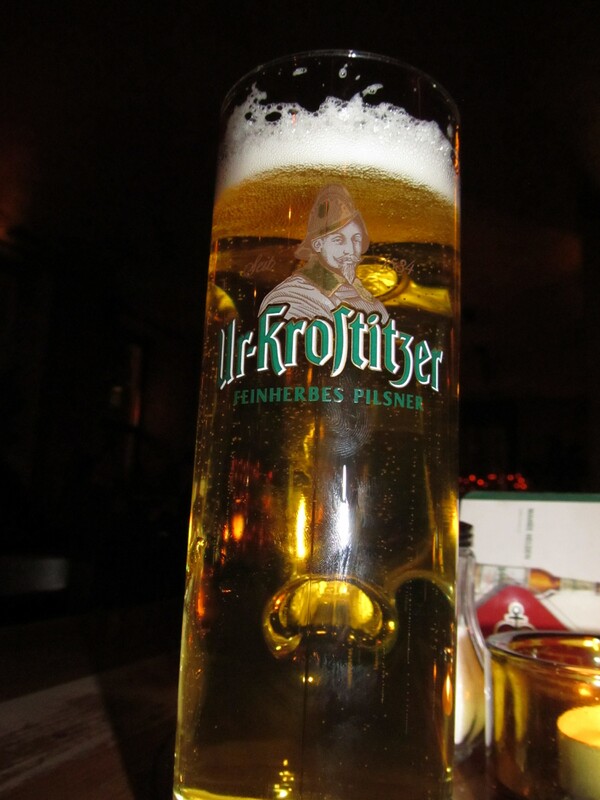 Berlin is still top of the list as far as taste, but this one was delicious regardless. Just when we thought our fingers were numb from the cold we found a cute little coffee house and got some tea and hot chocolate. The best part was that the sun came streaming in the window and warmed us up along with the hot drinks. We enjoyed our time with Cathleen reading a book and me working on my diary, content in each others company. 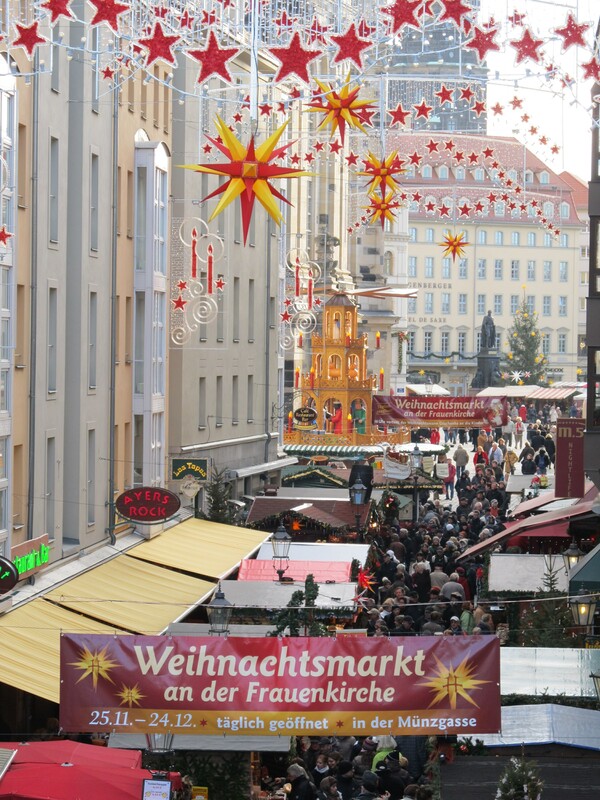 Heading out to continue our explorations we went through yet another market and found the gluwein stand. 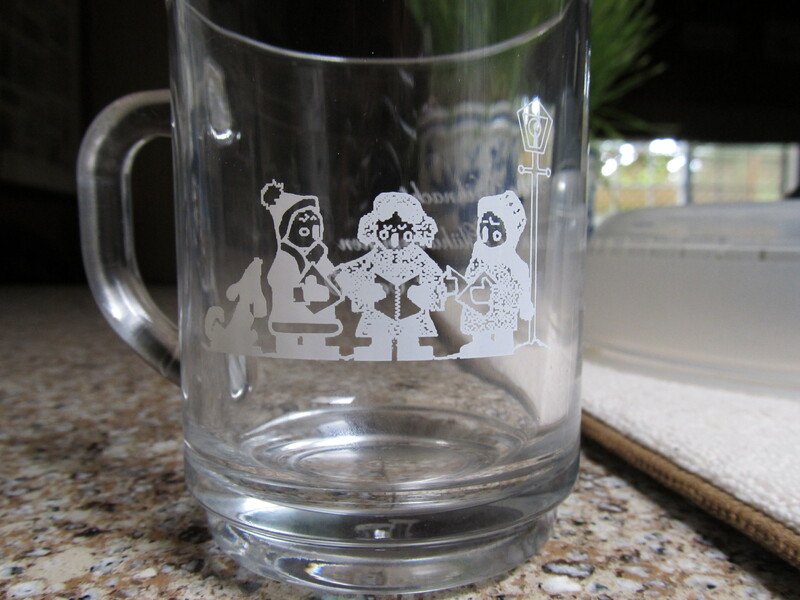 Of course we had to visit almost every stand before I decided on a mug. The first stand had a mug in the shape of a boot that was my first choice but then trying to clean it would have been a chore, so I opted for a nice blue one. IT turned out that Dresden had a “Health Museum”, it sounded interesting and well, the selling factor was that it was free today. As we walked towards it we walked over some dropped fruit, as we took our first steps I noticed the leaves and as the reek of the squashed fruit reached my nose I realised it was gingko fruit. It might be good for the brain but it smells horrendous. This was followed by quick side stepping and trying to rinse shoes in puddles. The museum turned out to be super interesting, with lots of interactive displays all about the human body. The most amusing part to go through was the Human Sexuality section, which seemed to be getting a lot of repeat visitors from the boys of the high school group just ahead of us. Unfortunately, it was mostly in German and I was feeling to tired that I zipped through it and went to go sit and relax. In excellent fashion, Cathleen had found us a rideshare home for 5 euros. 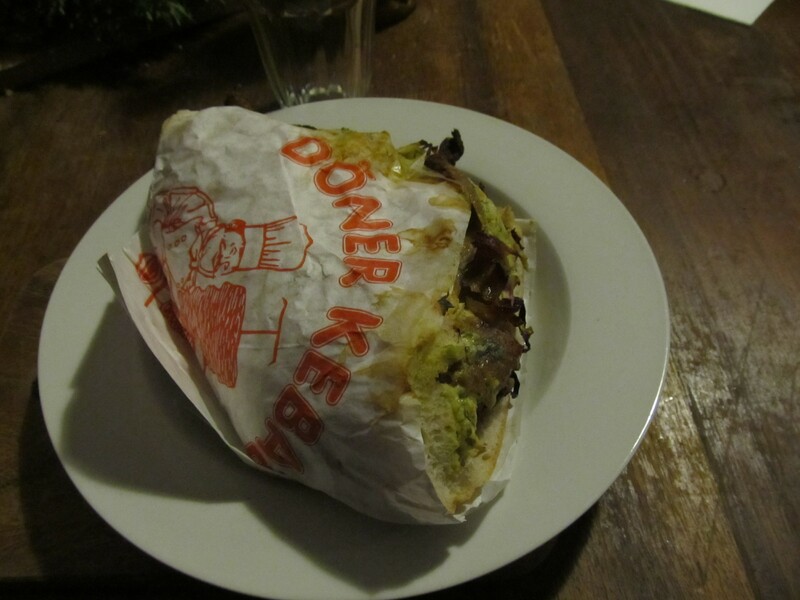 On the way back Cathleen introduced me to the Doner Kebab shop, famous for its huge sandwiches. It was amazing, but impossible to finish, at least on my part. A great end to another great set of explorations! This morning I woke to a wonderful surprise. 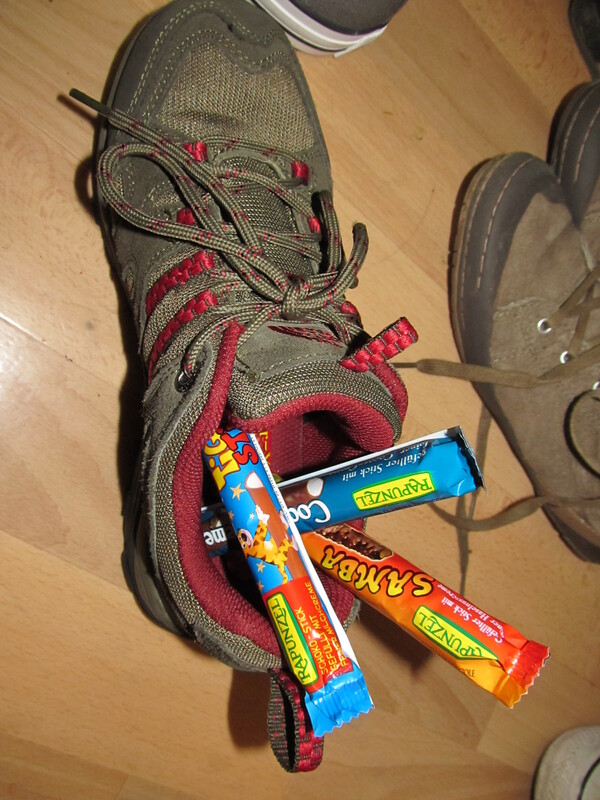 Apparently during the night Sinterklaas (Saint Nicholas) had visited all of us and left candy in our shoes, even me as the visitor. I can not explain how that made me feel, to be included. Our Sinterklaas doubles as an Opera student and is Cathleen’s roommate. Cathleen had class this morning and then we were going exploring, so I spent the time catching up on my blog. There had not been very easy internet access in Nepal and so I was quite behind (kind of like now…oops). For lunch I enjoyed another of Germany’s fine bread rolls with amazing cold meats and cheese. I am so in love with country’s for their food. Upon Cathleen’s return she excitedly told me where we were going to go, then she told me how…by bike. Now, I am ever so slightly ashamed to admit, I cannot ride a bike, in fact I have a serious fear of it. Now this is not because my parents were negligent in providing a bike when I was growing up. I recall a rather nice bike. However, I seem to have never mastered the breaking system. For many years I thought they had given me one without breaks, my brother had handle breaks, what I failed to understand is that mine was designed for younger and less agile children and therefore had back peddle breaks… obviously I was way below less agile. I was terrified of going downhill, and having my brother stand at the bottom of one around age 5 saying “Don’t worry, I’ll catch you” and then promptly running him over, my fear did not abate anytime soon. As I got older many friends tried to teach me, but being of 5ft nothing statue, their bikes were giant and usually involved injury or there about. I could go, it was just the start, stop and balance i had real issues with. (Today I have a 3 wheel bike and love every moment of it, it even has a basket and a bell). Cathleen ignored my pleas for mercy, insisting that it was an irrational fear and once I got going I would be fine. Her roommates bike was a stylish classic model… whose seat did not lower and was higher than my waist. I was on the verge of tears and shaking as I tried to get some balance and felt like a complete failure as we headed out at a rather fast paced walk. Since it was getting late we had to try do everything double time, the bike would have been much faster (and I would most likely have caused an accident). It was a wonderful crisp December afternoon and I rather enjoyed the walk. Growing up in South Africa I never really experienced winter and in Oregon on the west coast of the states winters are very wet, so it is a real treat to have a day like this one. 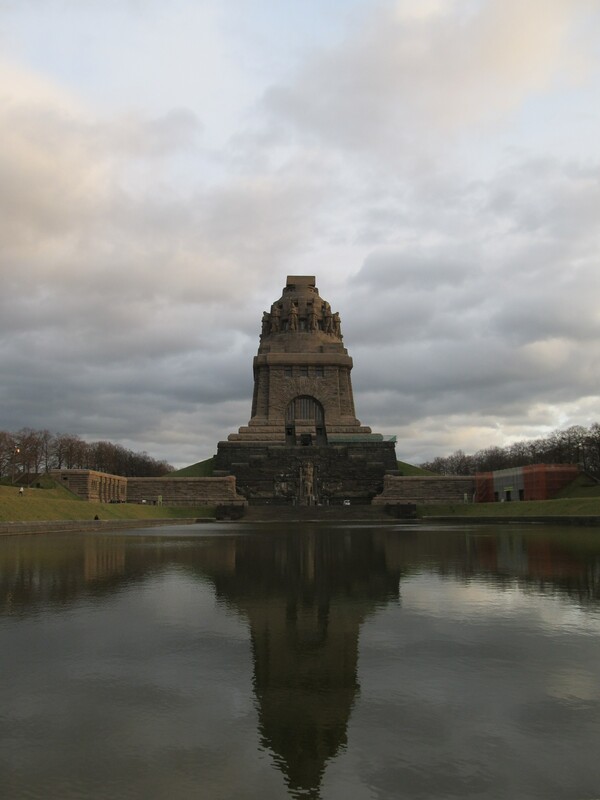 We were heading to a monument commemorating the defeat of Napolean, used as a gathering place for speeches given by Hitler during WW2. However, with it’s 200yr anniversary coming up the place was getting a new lease on life and with a stunning pond in front of it reflecting the image, it made for a great stop. 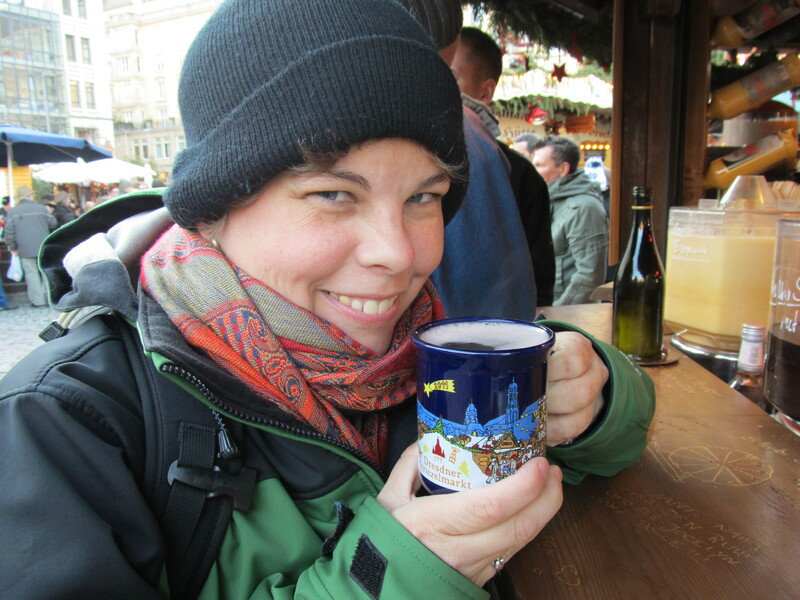 Cathleen enjoys using it as a perfect choice for the hangman word game, VOLKERSCHLACHTDENKMAL… Now if that isn’t a mouthful! We had planned to go up and see the view and read about the history but the cost was 6 euros, that’s a bratwurst and a mug of gluwein. Cathleen said before it used to be cheaper to just go up for the view, but they policy had changed recently. Instead we headed home stopping at a local store to pick up some sweet goodies, chocolates, licorice, marzipan….. OMG I love this country! 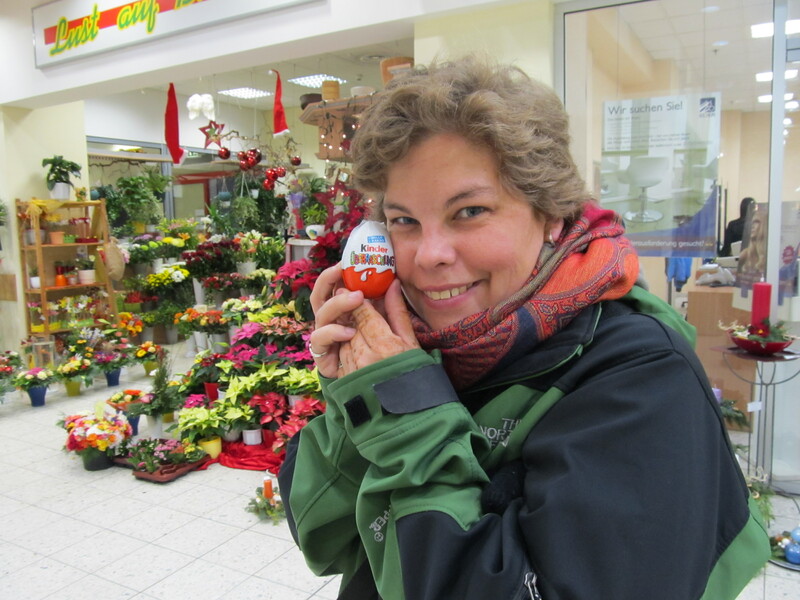 Kinder Eggs Are My Favorite! 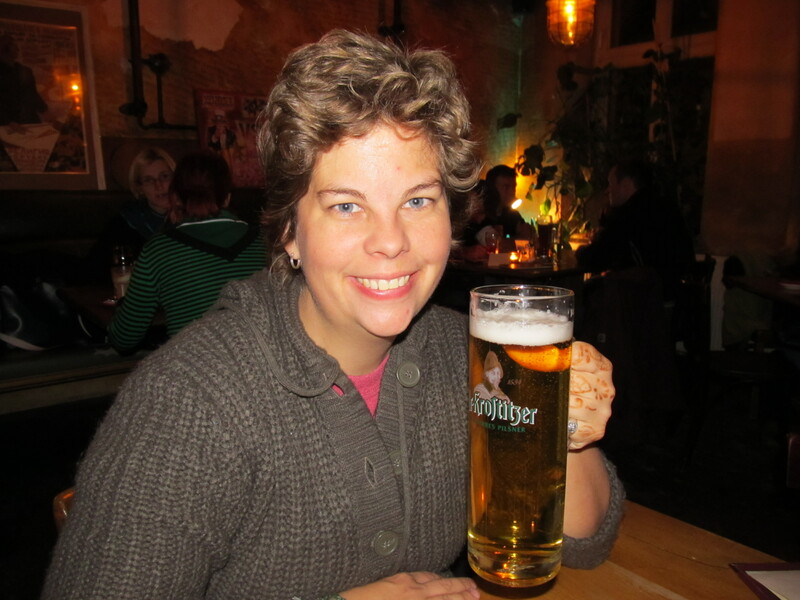 We popped out for a quick beer with one of Cathleen’s friends that evening, my first German beer (I had been consuming on Gluwein by the mugful up to this point) and it was delicious.